This summer you may want to stay out of the sun to protect your vision. Most people know that exposure to the sun, especially at the height of summer, can damage their skin. But few people realize the serious toll the sun can take on their eyes. Extended exposure to the sun’s ultraviolet (UV) rays is one of the risk factors associated with eye disorders such as cataracts. Levels of UV radiation are particularly high during summer months (3 times higher than in winter), between 10am and 3pm and at high altitudes (for example, many ski resorts). 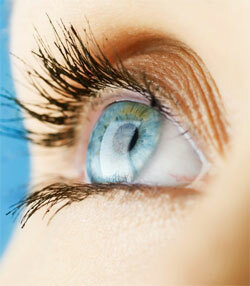 Ultraviolet light is the component of sunlight most responsible for eye damage. Ultraviolet light rays come in three main types – A, B and C – categorized according to their wavelengths. UV-C is the shortest and potentially the most dangerous wavelength, but it is largely absorbed by the Earth’s atmosphere and therefore is less of a threat than UV-A or UV-B. UV-A. Excessive exposure to UV light, especially from light reflected off sand, snow, or pavement, can produce a burn on the surface of the eye. Like a sunburn on the skin, eye surface burns are painful but usually temporary. Long-term exposure of the eye to UV light affects not only its surface (cornea and conjunctiva), but also its internal structures (lens and retina). The rays absorb by the retina and the conjunctiva can be quite dangerous if they are absorbed in a sunny day , in high altitude, on the sand or on the water, where there is an important reflection from the bottom. UV exposure is a risk factor in the development of cataracts, or clouding of the lens. Sunburn of the cornea, sometimes called snow blindness.Light rays reflect off snow and enter the eye, hitting the cornea (in red) and the protective layer (in white). The rays burn the eye, ca using temporary blindness. 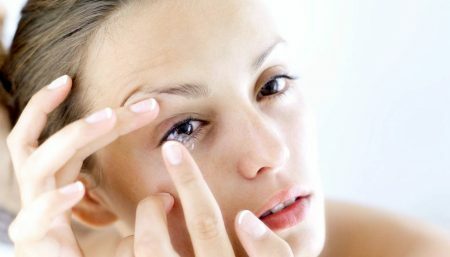 Skin cancers on the eyelids. 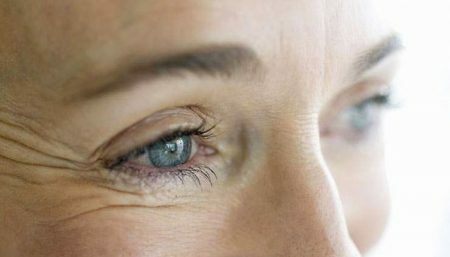 New research shows extended exposure to sunlight may lead to age-related maculopathy, also called age-related macular degeneration – an eye disorder that can cause blindness.Researchers from the University of Wisconsin Medical School in Madison followed more than 3,600 patients for five years and more than 2,700 patients for 10 years. Patients were between 43 and 86 years old. Participants who reported being in the sun for more than five hours a day during their teens, 30s, and at the beginning of the study were three-times as likely to develop increased retinal pigment – a characteristic of age-related maculopathy. These patients were also twice as likely to develop early age-related maculopathy over 10 years, compared to patients who reported spending less than two hours a day in the sun. 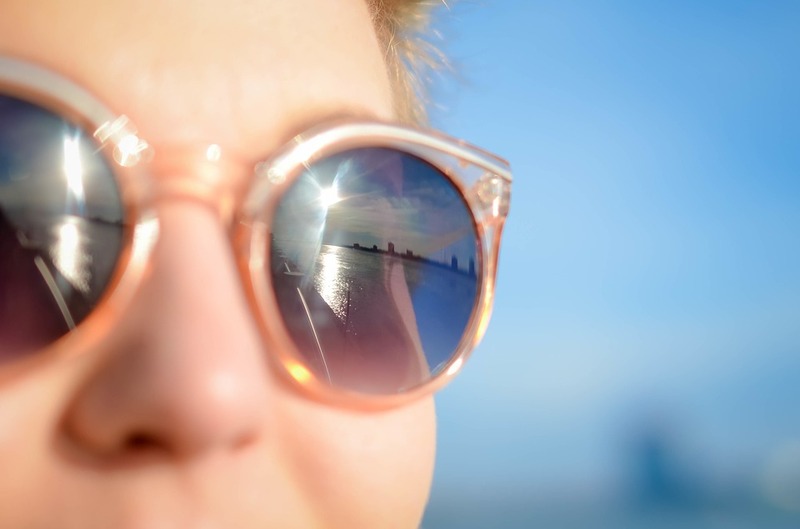 Results also show participants who reported being in the sun the most had about a 50-percent lower risk of developing characteristics of age-related macular degeneration when they used hats and sunglasses at least half the time. On the other hand, those who reported experiencing more than 10 severe sunburns during their childhood were 2.5-times more likely to develop abnormal blood vessels in their retinas, which is associated with age-related maculopathy. Sunglasses with UV blocking lenses can help shield eyes from UV rays in sunlight. However, even most sunglasses that offer UV protection block only about 50% of UV radiation – because sunlight also enters the eye from above and around the sunglasses. Good colours for sunglasses are gray, green or brown. Gray lenses do not distort primary colours so they are good for driving. Green lenses let the maximum amount of useful light reach the eyes on an overcast day, and brown lenses sharpen detail and provide better protection against glare. Those labelled “EPF 10” (Eye Protection Factor rating 10) actually exceed the requirements of AS 1067 and thus provide even greater protection. Others may be labelled “absorbs 100% UVR” these should also carry the AS 1067 label. Wearing a broad brimmed hat with sunglasses can further reduce exposure to UV rays. Wrap-around frames protect your eyes from all angles and are a good choice if you are in the sun all day. Polarised lenses cut reflected glare, and are perfect for skiing, boating and the beach. Wearing UV blocking contact lenses in conjunction with sunglasses. Contact lens wearers have a means of protection from damaging UV rays – UV blocking lenses, which filter UV radiation. 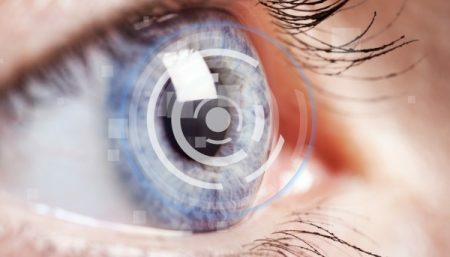 The U.S. Food and Drug Administration (FDA) recently approved a new indication that ACUVUE® UV blocking contact lenses “help protect against transmission of harmful UV radiation to the cornea and into the eye.” However, clinical studies have not been done to demonstrate that wearing UV blocking contact lenses reduces the risk of developing cataracts or other eye disorders. NOTE: The American Optometric Association warns that UV blocking contact lenses are not a replacement for UV absorbing sunglasses. However, the AOA acknowledges that, when worn with sunglasses, UV blocking contact lenses provide protection by blocking much of the UV rays that reach the cornea and that get into the eye through the open spaces at the top, bottom and sides of sunglasses.